Once again I have gotten behind in Ali Edward's One Little Word 2017 class and am taking time to do some catch up this week. The September prompt included thinking about our life with regards to rest, pace and joy. I printed the title and prompt cards and added my journaling based on the past few months. I didn't necessarily relate everything to my word ACTIVE; I just noted how I take time for rest, how I slowed down my pace after beginning a hectic September, and the things I'm finding joy in right now. The photo I included was from a Friday afternoon in late September when I took myself out for an hour of ice skating. 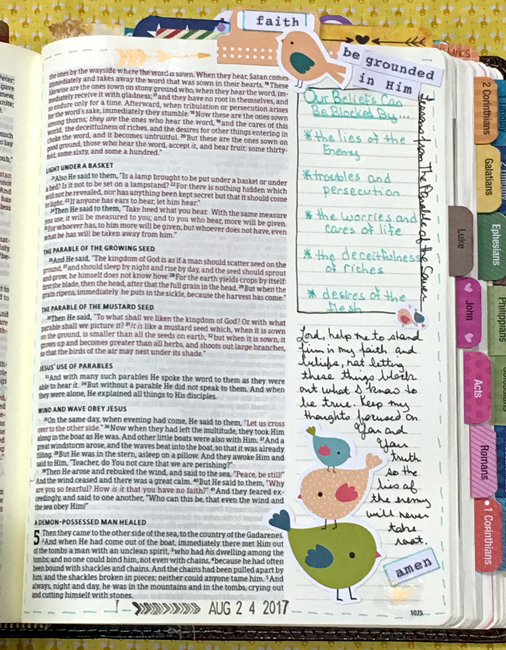 I added some washi tape along with a flower my sister Brenda sent in one of our monthly book swap packages earlier this year. While I haven't focused on my word as much this year as I have with previous words, I'm glad I chose a word and signed up for the class. 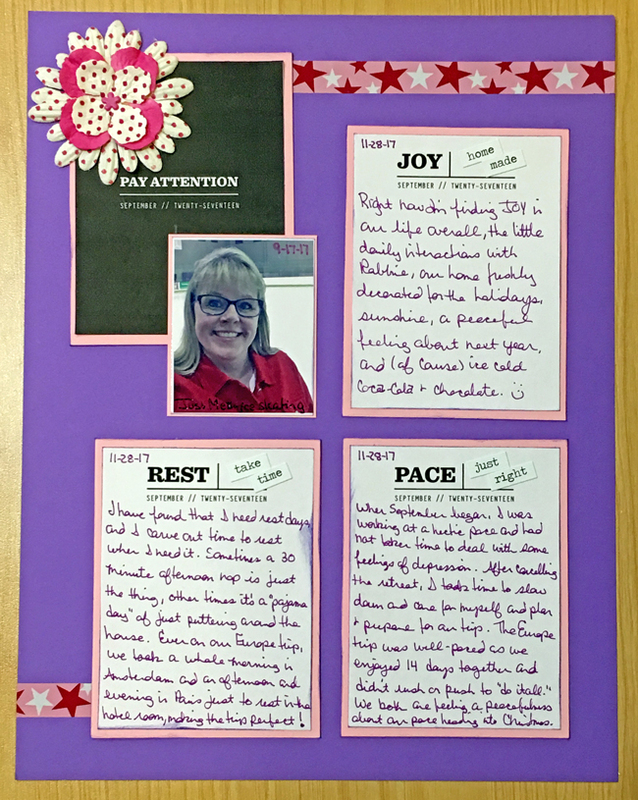 I'm hoping to catch up with the remaining prompts over the next couple of days so I'll be ready for the final prompt of the year (and be caught up with Brenda who has done a fabulous job with the class and her OLW BALANCE album!). 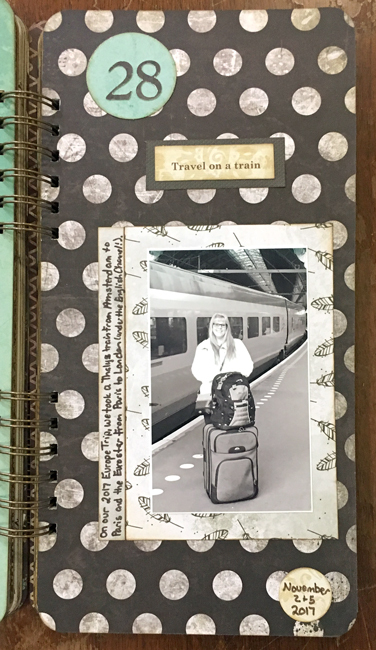 I've ridden on a train several times in my life (the Texas State Railroad train tour, New York subways, Universal Studios' Hogwarts Express), however, when I added "travel on a train" to my list of 50 Things To Do Before I'm 50, my goal was to travel from one city/town/state/country to another on a train rather than driving or flying. I checked this item off my list on our recent trip to Europe. In fact, we traveled by train several times. 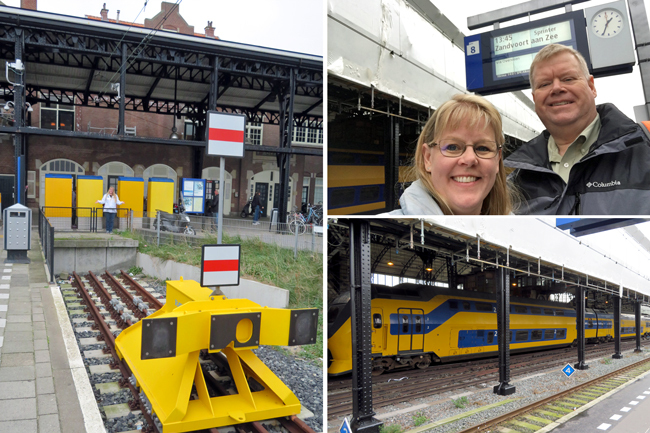 First, we took a Netherlands Railway train from Amsterdam to Haarlem, then all the way to Zandvoort - the end of the line. Traveling by train for this day trip was quick and easy and gave us plenty of time to enjoy Haarlem and a walk along the North Sea beach before heading back to Amsterdam! We had first class seats, which included a selection of light eats (some good, some...uhm...interesting) near the beginning and again near the end of the trip. It was a comfortable ride and we arrived in Paris right on schedule. 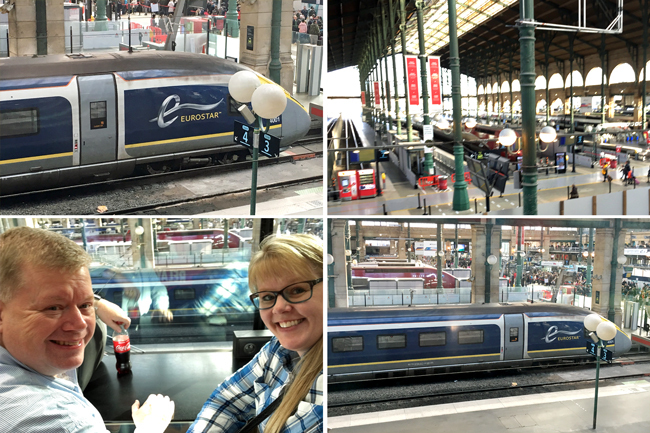 And, finally, three days later, we rode the Eurostar from Paris to London. 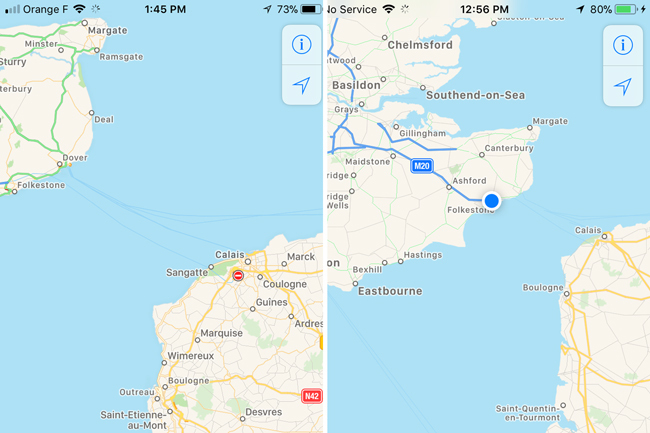 The UK is not a part of the Schengen Agreement, so our passports were checked this time. We also had to go through security, which was somewhat different than airport security since there's no checked luggage. We had to place all items, including our 50-pound suitcases, on the scanner belt ourselves. Once again, we had first class seats, which were very comfortable despite the fact that I had unknowingly booked seats riding backwards. 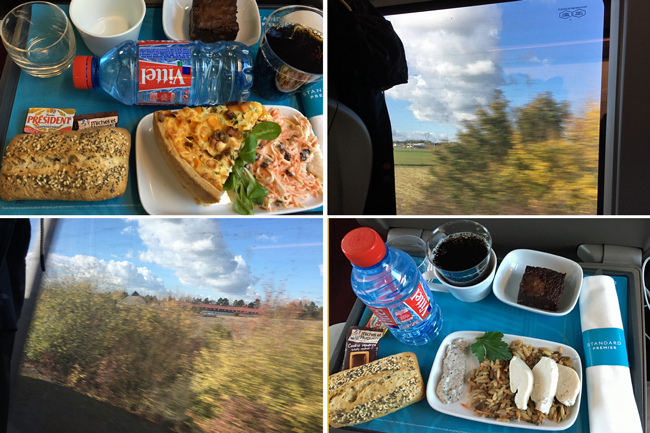 We had plenty of room to enjoy the countryside flying by, as well as the (uhm...interesting) meals that were served shortly after we left the station. 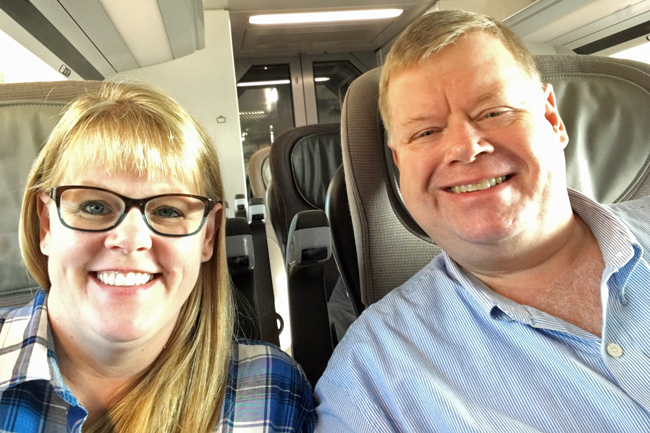 The best part of all this travel by train, of course, was being on vacation together, visiting new places, trying new things, enjoying each other's company! Here's a look at the page in my 50 Things To Do Before I'm 50 album! I'm so glad I had this item on my list, and I'll definitely consider this mode of travel again when it's available. 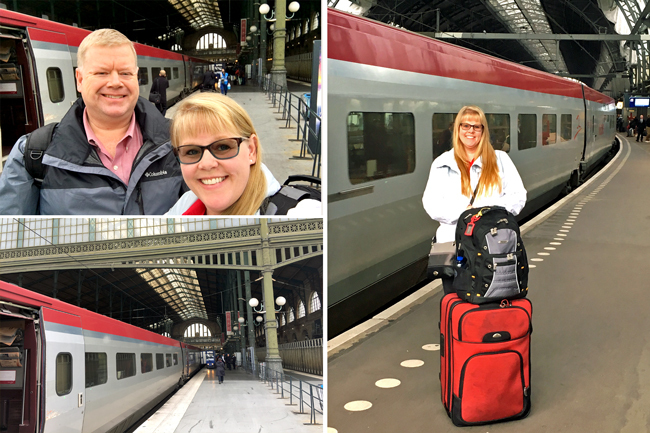 We returned home this past weekend from a wonderful two-week trip to three destinations in Europe - Amsterdam, Paris and London! 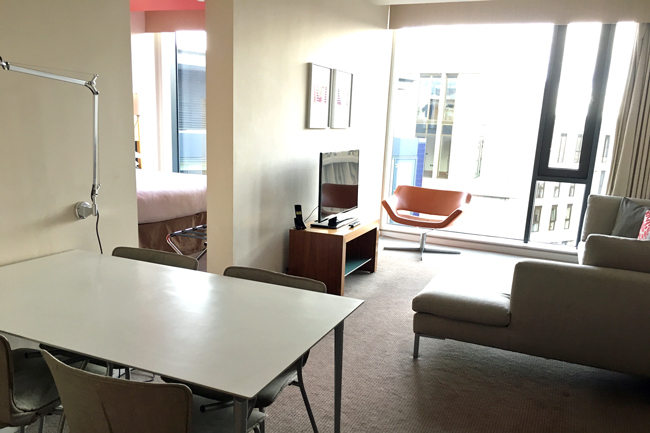 Along the way, we stayed in four hotels and changed time zones five times! 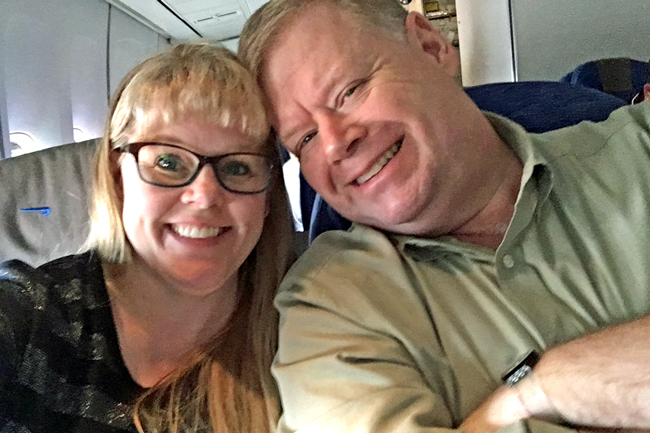 We began our trip flying on a 747 (one of the things Robbie's always wanted to do). We moved our watches ahead six hours on that flight, so it was already the morning of the next day when we arrived in London. It just so happened that we arrived on the Saturday that was the end of daylight savings time in Europe, so we moved our watches back one hour before going to bed that evening. 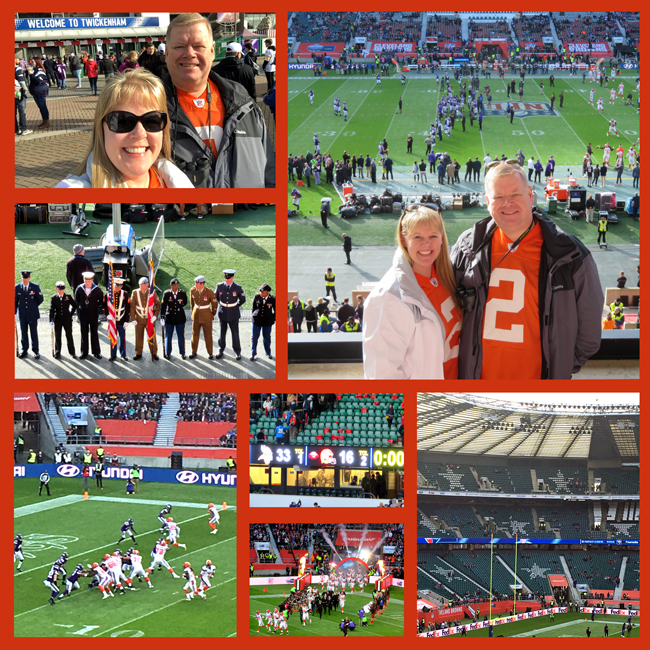 Sunday was a very crisp day with quite a few hours of sunshine - perfect for attending the Cleveland Browns versus the Minnesota Vikings NFL game at Twickenham Stadium. We thoroughly enjoyed ourselves despite the fact that the Browns lost. We fell into a peaceful sleep that night . . . only to be awakened by the fire alarm at 11:30pm. We slipped into our jeans & jackets, grabbed our passports, and trudged down the five flights of outdoor stairs into the very chilly night. 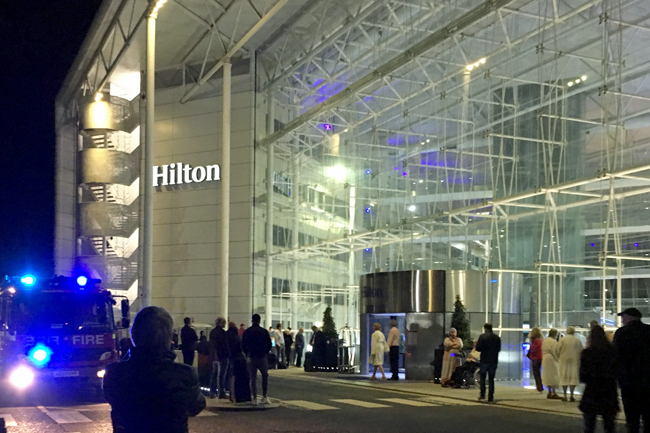 Fortunately, there was not a fire - while the hotel apologized for the inconvenience, the lack of an explanation leads me to believe that someone on the hotel staff set off the alarm accidentally. The next morning, our flight to Amsterdam was only an hour and a half, yet we lost another hour as we moved our watches ahead to another time zone. 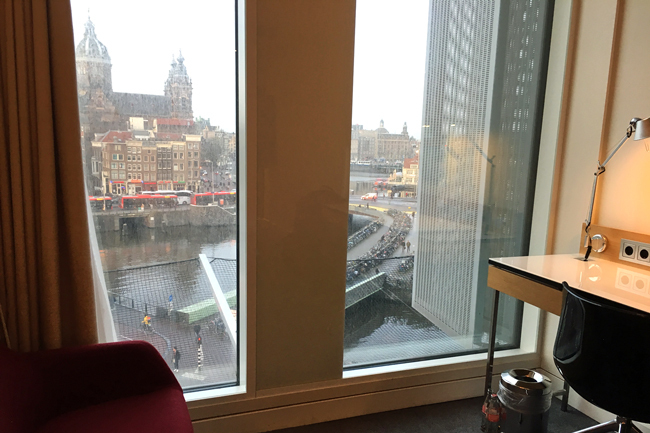 We arrived at the Schiphol Airport where we took the train into Amsterdam Centraal and checked into our room with a great view of the city and canal. 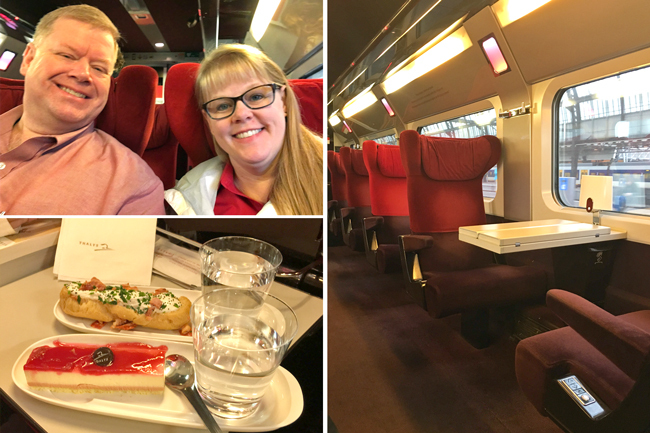 After two and a half days, we boarded a train for the three-hour trip through Belgium to Paris, France. 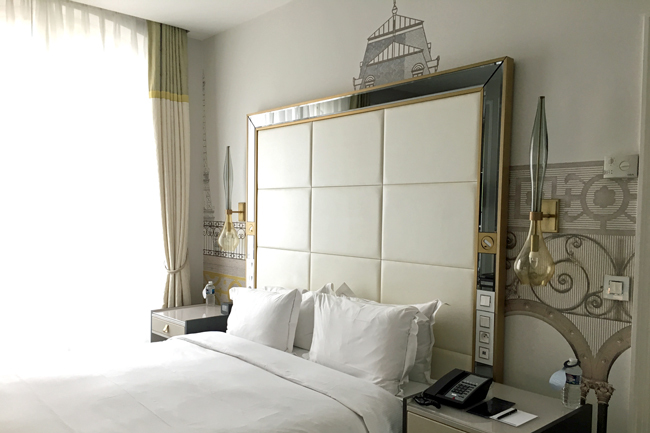 Our room was lovely, very Parisian, although the view out the window was disappointing as the mall across the street was under construction. Three days later we headed back to London, changing our watches back an hour in the process. 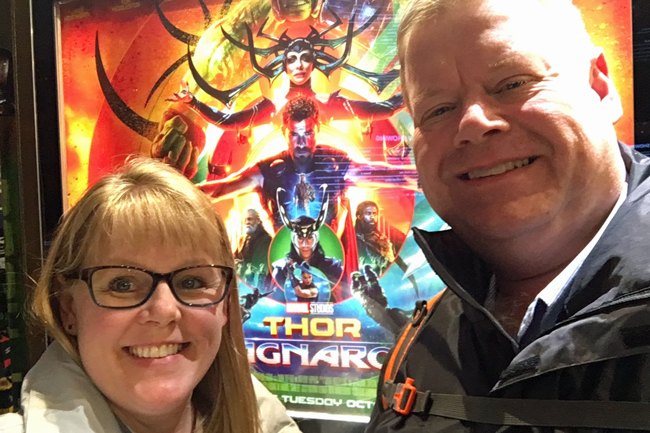 We headed out to see the new Thor movie and enjoy a steak dinner in Leicester Square the first evening. We were not aware of the annual anti-establishment protest march that was taking place until after we walked out of the restaurant and heard pops (like fireworks) and saw a group of people running toward us in the midst of smoke bombs. Along with others in the area, we hurried into a nearby building as the protest group raced past, most of them wearing masks, followed by a troop of riot police. Honestly, it was very frightening! It took the bicycle rickshaw driver we hired a good while to get us back to our hotel as he had to continually backtrack and go out of the way to avoid the crowds and multitudes of riot police! We were glad to arrive back at our hotel suite, although I didn't sleep very well at all that night! 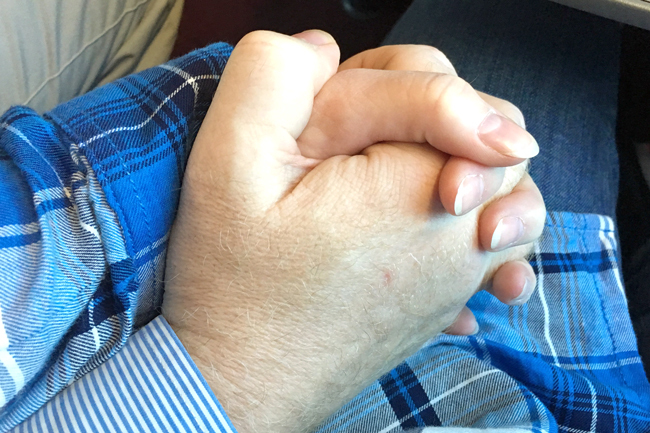 I'll be sharing lots more photos and stories from our trip, along with the three items I checked off my 50 Things To Do Before I'm 50 List, in upcoming posts. 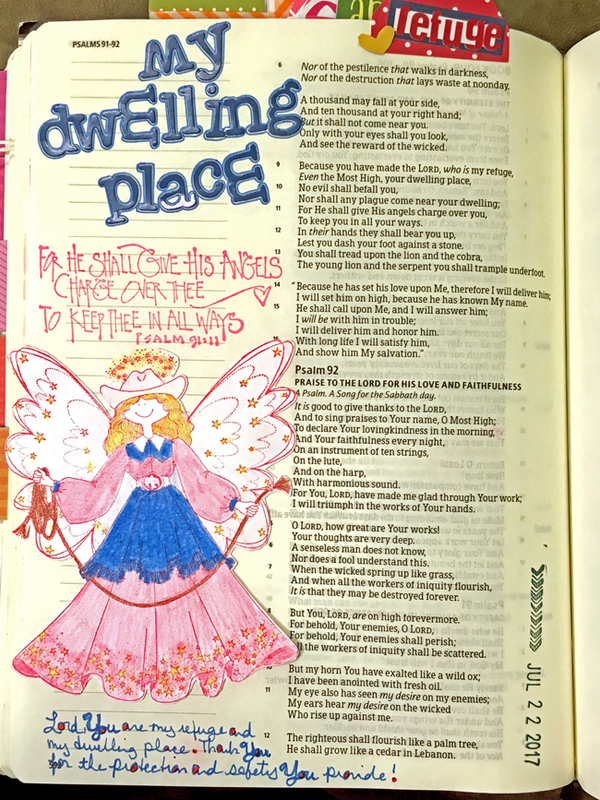 Psalm 91 has long been one of my favorite chapters in the Bible! This beautiful psalm describes the safety we can experience when we abide in the presence of God. When we make the Lord our dwelling place, he will provide refuge and safety and protection, we will not be afraid, and pestilence and destruction will not come near us. He will give His angels charge over us! 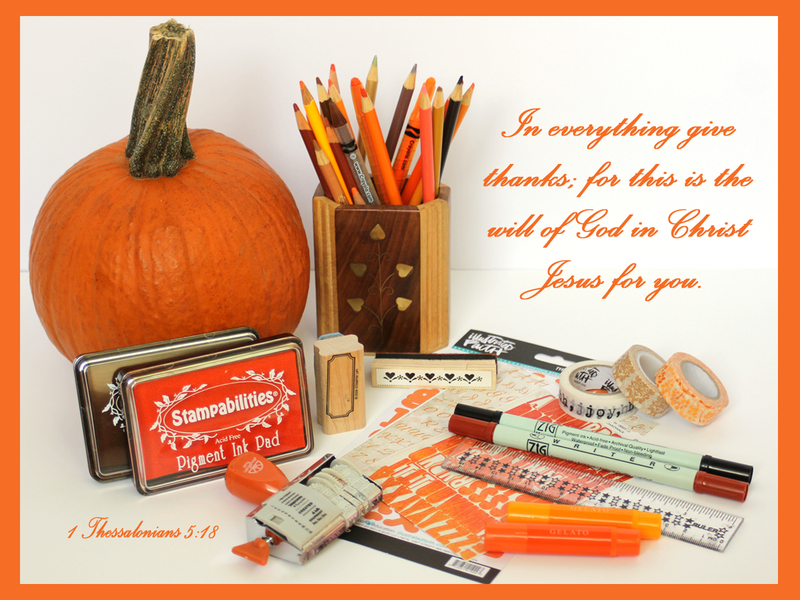 He will set us on high and be with us in trouble and deliver us and honor us! What more incentive do we need to make Him our dwelling place? I'm not sure how I made it all these years without ever carving a pumpkin. 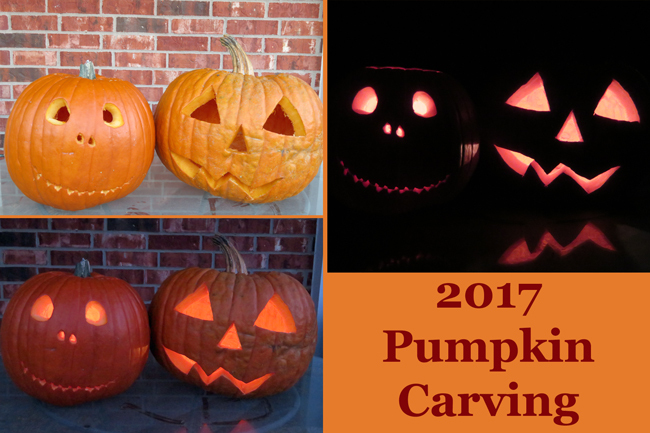 I've purchased pumpkins for fall displays, but we've never carved any of them. Last year we actually got a pumpkin with the intention of carving it the weekend of Halloween, however, Robbie had to go out of town for an unexpected business trip and we never got around to it. Of course, we could have carved it anyway, but the INSPIRATION just wasn't there. 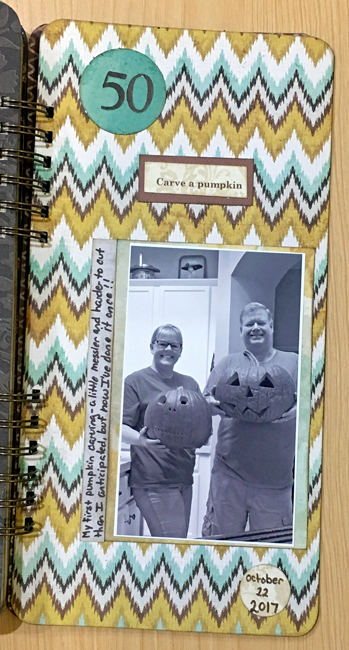 This year, I was determined to check this item off my 50 Things To Do Before I'm 50 List, and we purchased several pumpkins early in October. 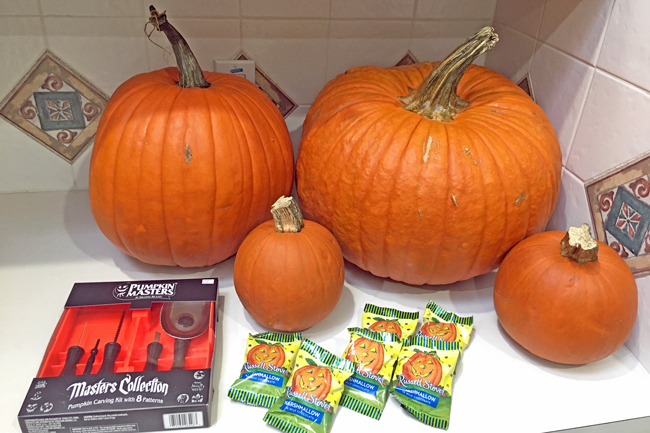 Later in the month, Robbie picked up a pumpkin carving kit for me, and I might have grabbed a few chocolate marshmallow pumpkins to enjoy, too. 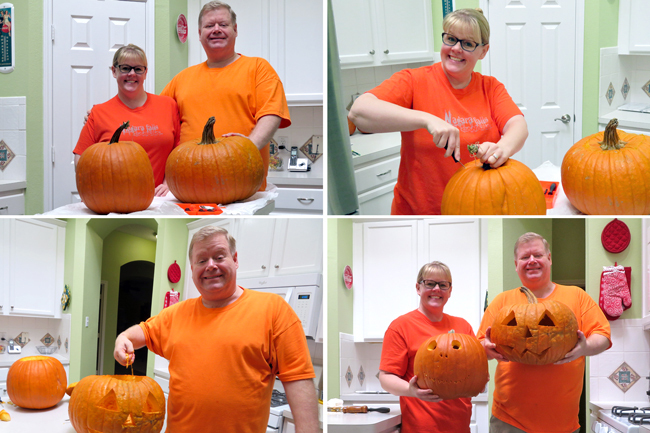 We spent a FUN afternoon carving the pumpkins. 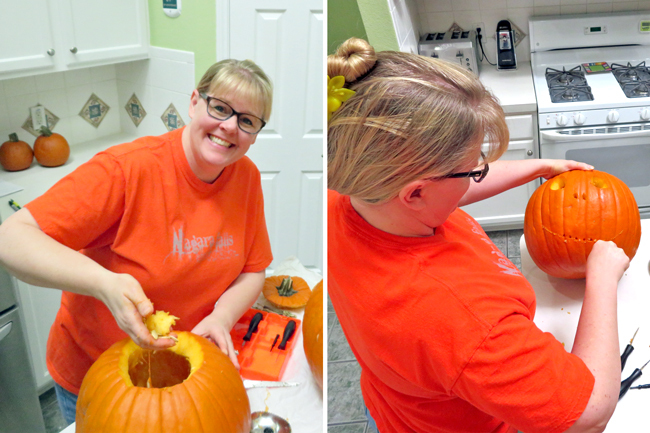 I have to admit that I didn't enjoy cleaning out all the messy goo and it was harder to carve than I anticipated (especially since the rind on my pumpkin was twice as thick as the one on Robbie's pumpkin, even though his was a lot bigger in size!). We set our creations outside, and I really do like the way they looked all lit up! While I doubt this will become an annual activity, I'm happy to say I was ACTIVE in checking another item off my 50 Things To Do Before I'm 50 List! I've always thought of the lessons in the parable of the sower as being for those who are hearing the Word for the first time. However, a few months ago, I participated in a mini-course hosted by Florence Achama Ukpabi, and she shared how there are lessons in that parable for all of us at every stage in our faith walk. While those hearing the Word for the first time can have their belief blocked by the lies of the enemy, troubles and persecution, the worries and cares of life, the deceitfulness of riches, and the desires of the flesh, we too can succumb to disbelief due to these same blockers. The same things that block others from believing in Christ can cause us to question and not live out the truths that we know. While we may not question the truth of our salvation, we may have trouble believing or hearing the Lord's direction in other areas of our lives. We must be aware of this so that we do not allow these things to block our beliefs and our ability to live the abundant life that God has for us!